When planning your special day, there are many important things to take into consideration. What will your main color palate be? Where will you exchange your vows? Who will be on the guest list? Another essential wedding day plan that you’ll want to think about is what you’ll be feeding your guests. If you’re hosting your wedding in Leavenworth, WA, you’ll have plenty of options for catering, but our venue has a few personal favorites that we’d love to share with you. Here is a quick overview of our favorite local Wenatchee catering restaurants and companies that you may want to use for your special day! Planning a wedding can be a long and stressful process. Luckily for you, we’ve created our Leavenworth Wedding Guide, an online booklet that makes planning your big day at our beautiful venue much easier. Inside its pages, you’ll find all the information for our wedding packages, our favorite local photographers, DJs, and choices for Wenatchee Catering. It’s the only thing you’ll need to plan the wedding day of your dreams. Since 2008, Two Chefs Catering in Wenatchee has been committed to helping customers create their ideal event. Their passion for food, wide variety of tasty selections, and excellent customer service makes them one of the most popular choices for Wenatchee Catering. Should you choose Two Chefs, you’ll have your choice of breakfast, lunch, or dinner options that are sure to delight your guests. Don’t forget to order the dragon sauce, Two Chefs’ signature sauce that is the perfect combination of sweet, spicy, and sticky. Son of a Brisket is a full-service Leavenworth catering company that can appeal to any palate. With St. Louis-style pork ribs, baked mac n’ cheese, coleslaw, and country-style potato salad, you’ll have plenty of choices for a delicious and casual wedding day meal. They are also very reasonably priced with meals starting at just $14.95 per person. If you want to feed your guests tasty Italian cuisine at your wedding, then the Alley Cafe catering is for you! Their buffet-style selections feature a fresh main dish with a choice of potatoes or rice as a side. You and your guests will also be able to indulge in a garden salad, rolls, and a dessert. They even offer six different banquet menus, each featuring a main dish, appetizer, and hors-d’oeuvres. Whatever you decide, we guarantee your experience with Alley Cafe catering will be one to always remember. 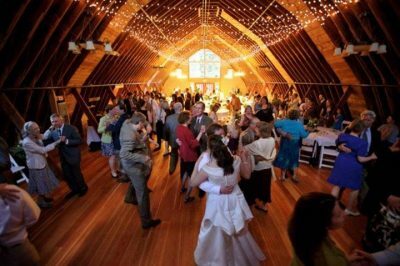 Our rustic and historic barn has quickly become one of Leavenworth’s premier wedding venues, and for good reason! We’ve hosted so many spectacular weddings that we are featured on popular websites and publications including The Knot, Wedding Wire, and Apple Brides! In addition to the barn, we also offer lovely outdoor ceremony and reception spaces with a gorgeous Cascade Mountain backdrop. We provide three different wedding packages to choose from, each one including wedding day must-haves such as dinnerware, seating, table linens, local wine from Eagle Creek Winery, beer by Big E Ales, and more. That way, you can spend less time planning your wedding day and more paying attention to what matters most, which is your soon-to-be-spouse. Find more information about hosting your big day with us on our Wedding Page and be sure to call us soon to schedule your wedding. Our romantic bed & breakfast suites are perfect for hosting you, your sweetheart, and your close friends and family for your wedding! During your stay, you’ll be treated to a delicious hot breakfast delivered straight to your door each morning, thoughtful amenities, and access to our incredible vacation packages and specials. Our convenient location just outside the Bavarian village of Leavenworth will also place you just minutes from our area’s top attractions, restaurants, entertainment, and more. Book your favorite suite with us today and we look forward to seeing you soon!